The documents below are available to provide ideas and principles around public engagement. Ontario’s Condominium Act, 1998, came into effect over a decade ago. Since then, the province’s condo sector has experienced remarkable growth and change. Condos now account for half of all new homes built in Ontario, and about 1.3 million Ontarians call a condo home. As the sector has expanded, it has also become more complex. Recognizing the need to update the legislation, Ontario’s Ministry of Consumer Services has asked Canada’s Public Policy Forum to lead an innovative, three-phase public engagement exercise that will inform the review of the Condominium Act. 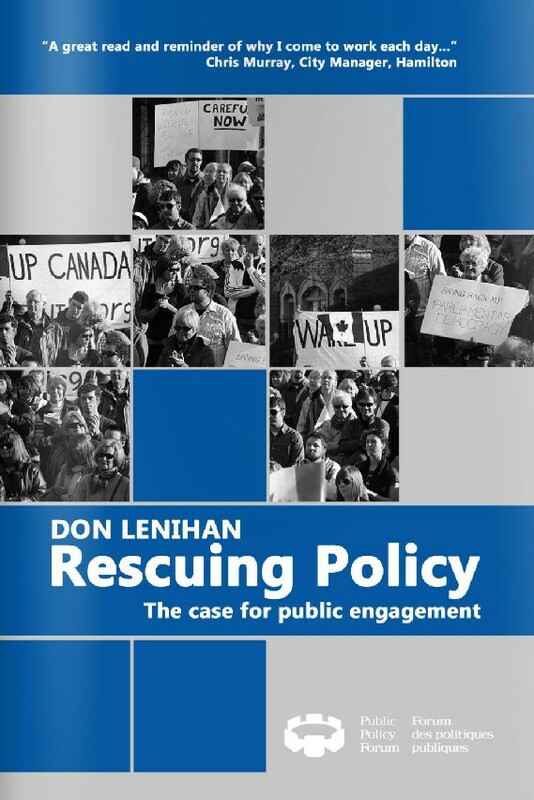 We have published the Stage One Findings Report, the Stage Two Solutions Report and A Case Study of Ontario’s Condominium Act Review (by Don Lenihan). This study looks at the Government of Nunavut’s Poverty Reduction process, a remarkable, year-long process that engaged some 800 of Nunavut’s 33,000 people, across the territory. The process resulted in recommendations in eight key areas, including the creation of a new kind of collaborative organization to lead community engagement on poverty reduction. The book is an authoritative and accessible guide to collaborative policy-making and the engagement processes that support it. With original case studies, this book will be of interest to students of government and governance from across the policy community. This paper serves as the final report on the Australian Government's Co-Design Community Engagement Prototype, a project that involved the federal government, the State of Victoria, 9 communities in Victoria, community service providers and residents, in 9 separate dialogue processes aimed at aligning services. This case study explores how internal labour mobility and foreign qualifications recognition shape the experience of immigrants in the Canadian labour market and reshape Canadian federalism. This roundtable series, which was part of the Canadian Sport Policy Renewal Process, brought together federal, provincial and municipal officials as well as sport and community leaders to determine whether a policy framework could be created that includes community-building but leaves the core business of sport unchanged. Co-Design: Toward a New Service Vision for Australia? The article, co-written by Don Lenihan and the former CEO of Medicare Australia, Lynelle Briggs, begins by examining the evolution of service delivery in Canada and Australia. It goes on to consider and compare the Forum's work on public engagement and Medicare Australia's work on co-design and how these may be leading to a new approach to service delivery in Australia. Working with 9 provincial and territorial governments through the Public Engagement Project, the Forum developed a Framework Paper that explains what public engagement processes are, why we need them, how they work, and some of the special issues, challenges and opportunities they pose for governments. This report summarizes the findings of the Forum's pilot projects on public enagagement in the Province of New Brunswick.